If I had built this… One of the design options for the Scott Bookcase. I abandoned it due to it’s complexity and the estimated length of time needed to complete it. When I started designing the Scott Bookcase, I went through four different designs. The design shown above was my imagination run amok. I say that because this design would have taken me a long, long time to complete. Architecture in furniture. 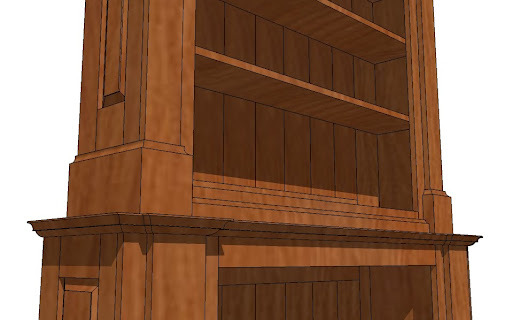 I like architecture and this design was an attempt to add architectural elements to a basic bookcase. This illustration was re-sized in SketchUp prior to exporting and it has lost some of it’s sharp detail. The spark. 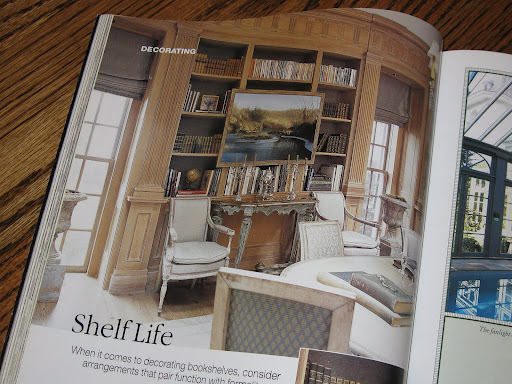 This built-in bookcase with it’s strong columns inspired this design. Photo taken from the September/October 2002 issue of Southern Accents magazine. A strong base. I like the double layer base to the columns. All of the base cap moldings were drawn as separate pieces and then moved into place. This is very time consuming. I later found a better way to do this. Columns continue. 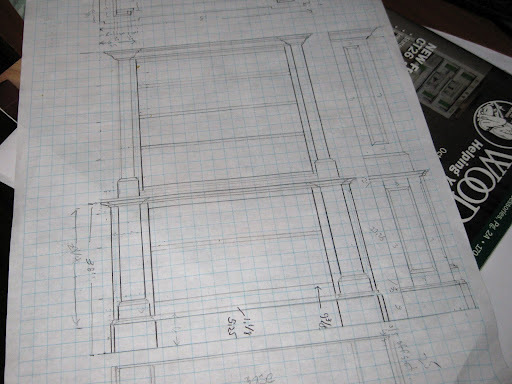 I kept working on a way for the column to continue to the upper bookcase. Note the lower bookcase table top and how it extends outward at each column. 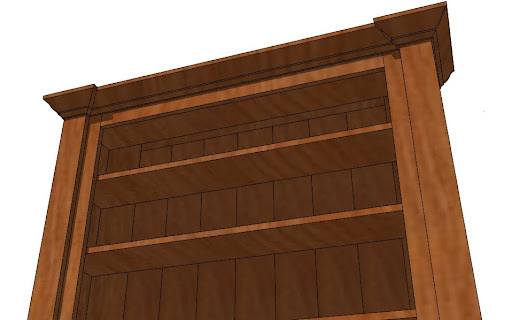 This is the first time I have drawn raised panels in SketchUp. A first. 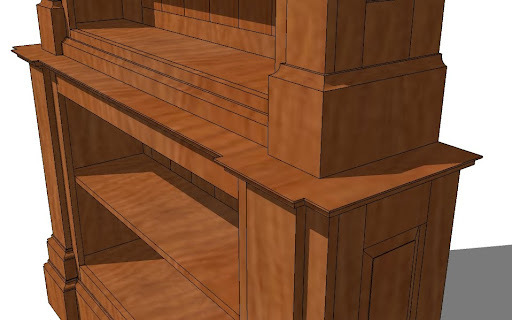 For the first time, I actually drew the quarter round molding located under the table top separatly from the bookcase. 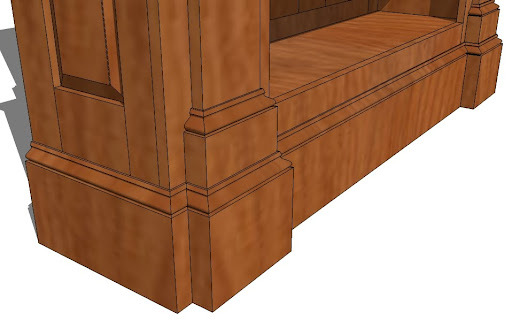 Normally, I draw the quarter round profile in place and then make it wrap around the furniture (problematic because it is difficult to make them components while they are in place). Here I drew a line that followed the path the molding would take, cut it and pasted it next to the bookcase. I then drew the profile and made it follow that path. I made components of each piece, grouped them and then moved the group in place. Worked like a charm and a lot easier than the base cap molding which I drew as separate pieces. Second attempt at crown molding. I originally drew a three piece molding which ended up being way too big and bulky. 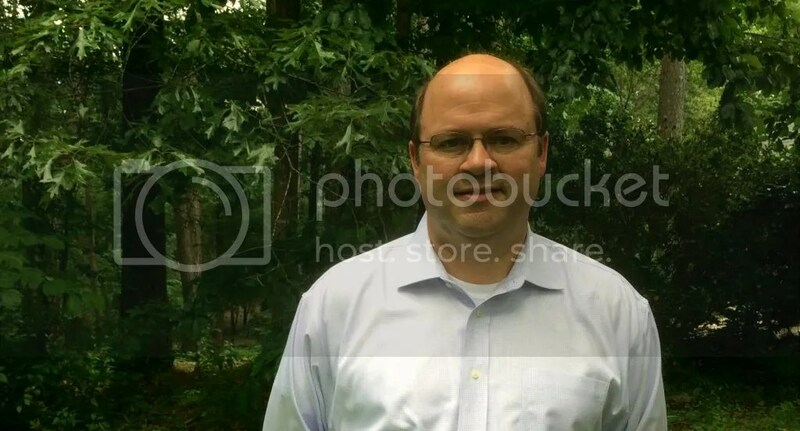 This simple crown worked much better. I also used the new follow-me procedure on the crown as well as the hide feature, which was new to me (to see how this is done, see the Dave Richards post on FWW.com about it here). I worked on this on and off for several days during the week. I tried a lot of new tricks in SketchUp for this illustration, so this was a good exercise. It was also good to see what this design would look like in 3D. I had planned a TV console update this weekend, but there is not a lot to report. I am currently smoothing out one of the glue-ups that will become the sides. Three boards glued together – the middle one warped upward forming a hump that I am removing. I worked like crazy on it today, generating so much saw dust and shavings that I once again got the electric blower out, raised the garage doors and blew all of it outside. I used my new cabinet scraper, an old block plane as well as a bench plane that I had lost, but found it. 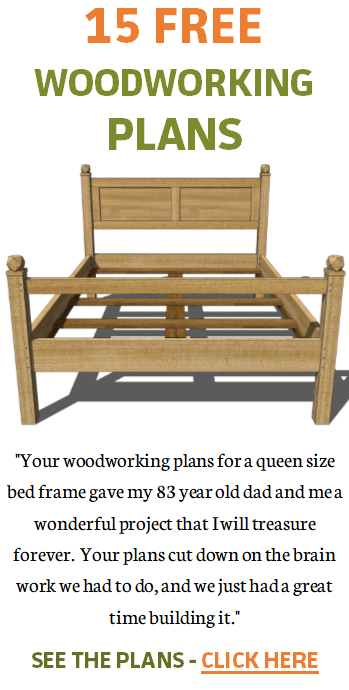 I am such a novice with hand planes – I may take a course on hand tools or something like that. There is still some work to do on this panel and then it is on to gluing up the sides and the base. But that will be for a post next week.